in Northeastern Pennsylvania - NE PA.
Poconos - Pocono Mountains - Stroudsburg - Wilkes Barre - Hazleton. Best birthday partiy venue in the country in the Pocono Scranton Wilkes-Barre area of Northest Pennsylvania (PA) . Complete party package with live animals and nationally known magicians in a stage magic show with the birthday children included. A great party place facility. We also supply top notch magicians and entertainers for Trade Shows, Corporate parties, Malls, Colleges, close up magic, stage shows, characters, etc. We have the finest birthdays that you can find anywhere. All parties are private or semi-private. Since we are not a bowling alley, or video game arcade your children are never mingling with strangers, or competing with other youngsters who are not attending your party for video games or other activities. NEW! WE NOW PUT YOUR BIRTHDAY PARTY CHILD'S NAME IN LIGHTS ON OUR MARQUEE ON MAIN AVENUE IN SCRANTON! THOUSANDS PASS BY EVERYDAY! The two hour and fifteen minute party and the two hour and forty five minute party. The main difference between the two, are the longer party, we add a hostess, so we can add a lot of extra foods and amenities. However, all of the fun entertainment parts are pretty much the same and we always keep everything running from start to finish. We supply you with color invitations in the shape of a large ticket. Each says admit one, to help you control who attends your party. They are in the shape of a post card and can be sent out as such. They can also be placed in a standard number 6 envelope, or just handed out to friends or at school. However, to keep things friendly, they are not required for your guests to get in. We have our own parking lot in the back of the building. There are signs in front directing your guests to the lot. 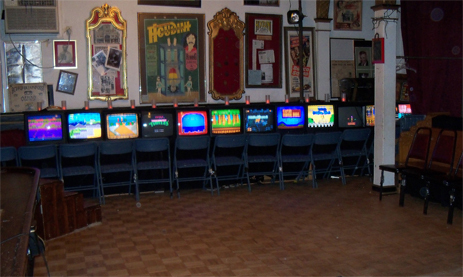 Begins in the private game area: The youngsters gather in our theater area, that is open space, and set up as a game room. We have special exciting disco lighting, bean bag toss game, hula hoops, limbo, ring toss, and a whole wall full of video games. Unlike others, our video games are ALWAYS FREE, and never take tokens or money. They automatically restart like a home game. There is no way to put money in them. Others who have video games give you a few tokens that are quickly used, and then you have to buy more coasting you as much as five to twenty dollars extra per youngster which greatly increases the cost of the party. Not possible with us. The youngsters also love our exciting limbo game. Our private party room. The most beautiful party room anywhere in the area. Your special birthday person(s) sits in their own jewel studded "throne" that makes them prince or princess for the day. 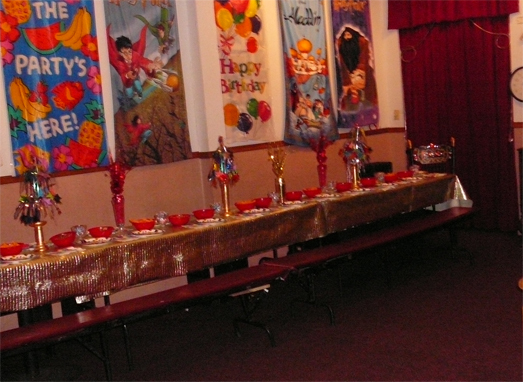 The walls are lined with age appropriate birthday and magic decorations. 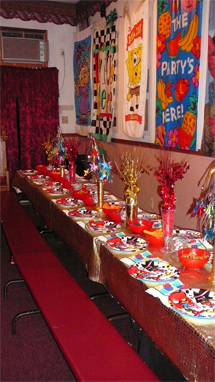 We have a long gold table cloth and special decorations on the table and supply designer plates and napkins. Cups and dinnerware are supplied. We supply, at this party, all the soda pop, bottled water, Capri Sun¨, you need for youngsters and adults who are attending. You supply the cake. (At all parties, you supply the cake.) You can also order in pizza. We have a great local place that makes pizza all the youngster love, or you can bring your own. Since, at this party, you serve and clean up at the end, to keep it simple no other foods or ice cream products are allowed. We keep it all running. When it is time to sing happy birthday we turn out the lights and have a disco light spinning around the room. Candles are included. Then we sing it again, but this time we sing it wild and crazy like New Years Eve. The youngsters love it. 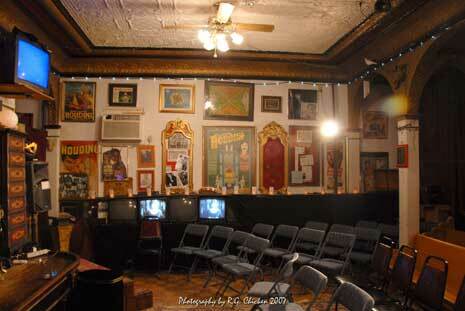 The professional magic show in our theater. The party includes our world class magic show. 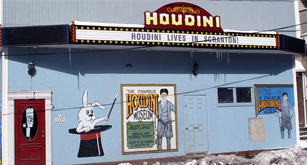 Our magicians have world wide recognition, unlike any one else in the area. The show includes live animals... a rabbit, a small poodle, a bird, a dove and many other surprises. We use the birthday child as a special assistant, should they wish, as well as others as well. We never embarrass them or make them feel foolish. It is a positive experience. Most of te time we float them in the air, pass a hoop around them, and bring them back down. They get prizes and become junior magicians. The closing. Everyone gets a balloon twisted in the shape of an animal, and three picks from our treasure chest that is packed with the kinds of things youngsters love (like you get blister packed as party favors0. A great send off from the greatest party they will ever attend. You can also bring treat bags if you wish. Every thing mentioned above in the basic party is included: The main difference is that we add a hostess and so we add a lot of extra food and amenities. All of the fun entertainment parts are the same. At this party the hostess not only sets everything up for you, but serves and cleans up at the end. Beside soda pop, bottled water, Capri Sun¨, we supply, in bowls lined up on the table, pretzels, cookies, and corn curls within reach of all your guests, adults and youngsters. We supply the pizza. We supply ice cream. Again, as in the basic party you supply the cake or cup cakes or donuts. We have a beautiful stand to put the cup cakes or donuts on, that is a big hit. Some kids do not take cake but the all love cup cake and donuts. To top it off we also supply cotton candy. This really bowls them over. Because of mess of all the snacks, ice cream and cotton candy our server handles it all. Do not try this at home! Custom goody bags are added. Besides the ballon animal, everyone gets their own bag to fill with 12 different items from our overloaded treasure chest. Boys get what they like and so do girls. Younger kids pick what they like and so do the older ones. Of course, the birthday child is allowed to pick many extra. A great send off from the greatest party they will ever attend. PRICE-BASIC PARTY: Everyone who attends is served and gets a ticket to our magic show. When we are running just our shows tickets are $20 each, without food. 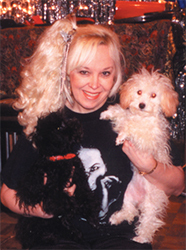 A magic show with live animals is included at no extra cost as part of your party. Monday-Thursday $169 for the first 10 people, and $6.95 for each person above 10 people. Children and adults are included in the count. Plus 6% for sales tax and a minimum of 18% to 20% for gratuity which is standard. Friday, Saturday and Sunday or Holiday $179 for the first 10 people and $7.95 for each person above 10, plus tax and tip. PRICE-DELUXE PARTY: Everyone who attends is served and gets a ticket to our magic show. When we are running just our shows tickets are $20 each, without food. 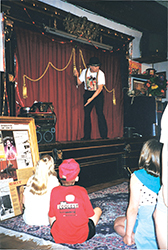 A magic show with live animals is included at no extra cost as part of your party. Monday-Thursday $179 for the first 10 people, and $7.95 for each person above 10. 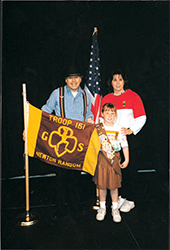 Children and adults are included in the count. Plus 6% for sales tax and a minimum of 18% to 20% for gratuity which is standard. Friday, Saturday and Sunday or Holiday $199 for the first 10 people and $9.95 for each person above 10, plus tax and tip. We also do sweet sixteen, over the hill, Kosher Bar-Mitzvah, Bas-Mitzvah, Purim, and Communion and Confirmation Parties. A recent quote from one of our guests, "More fun than Chuck E. Cheese!" Take I-81 to exit 190 the Main Ave exit go LEFT onto Main exactly 2 miles to 1433 N. Main Ave. Scranton, PA Free Parking around the back. Enter front or back. From the East (NY, NJ, Stroudsburg, etc. 80W to 380N to 81N. From the North East. 84 W to 380 N to 81 N. From the West (Pittsburgh. 80W to 81N. 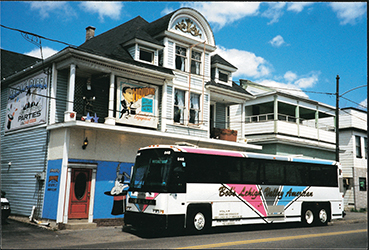 From the South (Philia, etc) Tpk Extension 476N to Pittston exit to 81 N.
A recent quote from one of our guests about our parties, "More fun than Chucky Cheese!"